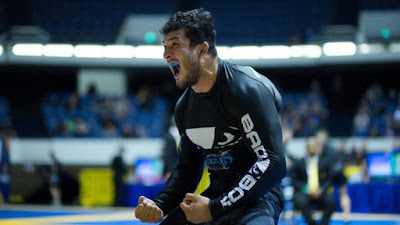 The world’s top BJJ athletes went to Anaheim, Calif. this weekend to take part in the year’s final big jiu-jitsu event, the World Jiu-Jitsu IBJJF No-Gi Championship. Lucas Hulk wound up standing out from his stiff competition. After climbing two weight divisions to tackle the super-heavyweight field, the Atos black-belt won gold at his new weight as well as the absolute. At super-heavy, he submitted each of his opponents, including the runner-up João Assis (Checkmat), who fell to a north-south choke. In the open division, he met ultra-heavy runner-up João Gabriel Rocha (Soul Fighters) in the final and beat him to claim a perfect weekend. Other big names, like Keenan Cornelius, João Miyao and Caio Terra, also appeared among the weekend’s champions.